Yesterday, I had an opportunity to spend some time with Jillian, Lynden and their son, Oliver (aka Ollie). As you know, Jillian is our Monday writer here at BibleJournal. Since our introduction in February, she has impressed us with her faith and zeal for Christ. The events that have unfolded over the last several days give great evidence for this. Late last week Jillian and Lynden’s son, Ollie, began experiencing significant abdominal pain. This pain resulted in being admitted to BroMenn Hospital and shortly thereafter transferred to the Children’s Hospital in Peoria, Illinois. Now, three days later, they wait for options which may include surgery. It takes time to accurately assess lab results. While waiting, we pray for healing and for Ollie’s pain to subside. During our brief visit, I did not experience a family broken down by the burdens of illness. Instead, I found a strong, faithful couple attending to and fighting for their son. Would you join us today in helping the McGriff’s navigate this trial? First, will you join us in praying for an immediate and full healing of Ollie? We give thanks that he is surrounded by God-gifted doctors and nurses in a world-class facility. Pray with us that He will continue to give them the availability and wisdom required to care for Ollie promptly and appropriately. Also pray that God will cause whatever is hidden within Ollie’s body to be known. Pray for Jillian and Lynden too. That they will be fully filled with His presence and the peace that He promises (Philippians 4:7). Can we also encourage you to join us in supporting them through practical provisions like food, diapers and money? One of our team members was able to establish a meal train that allows us all to easily assist from any location. 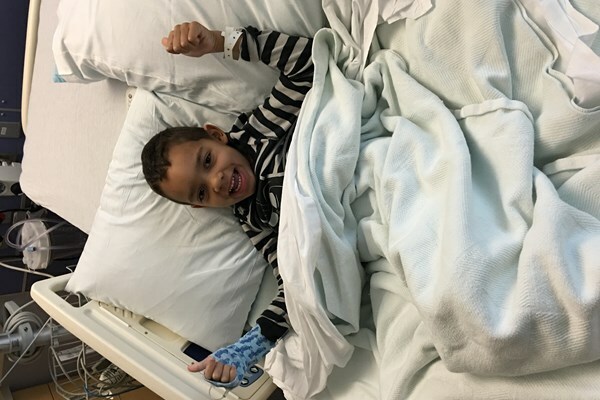 Let’s be generous givers to let them focus on spending time together as a family, meeting Ollie’s many needs, and working with the medical staff to ensure the best care and treatment possible. They will have medical bills, childcare costs, fuel/travel expenses, and time away from work.